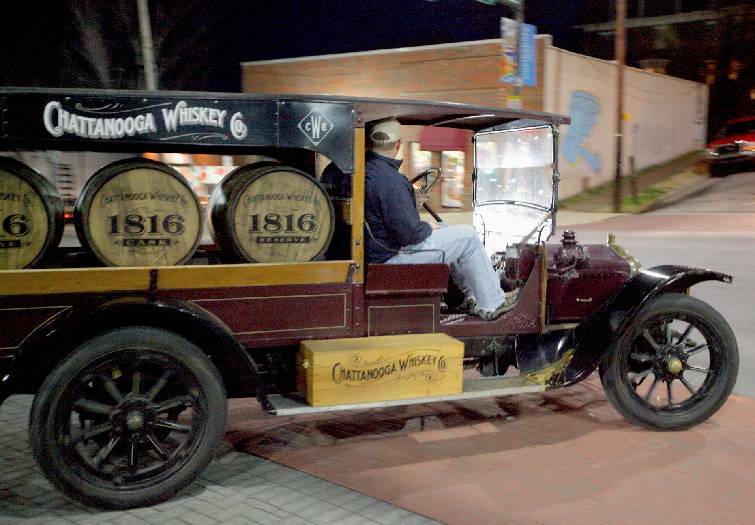 Chattanooga Whiskey Co. wants to build and operate a distillery at the site of the former Newton Chevrolet dealership downtown. The company is seeking a special exception permit from the city to run the distillery at 601 W. M.L. King Blvd. that can make 14 barrels a day with each holding 53 gallons, officials said Wednesday. That will make it one of the largest craft bourbon whiskey producers in Tennessee, according to the company. Company founder and CEO Tim Piersant said officials are excited about the opportunity to put local, high-quality manufacturing in Chattanooga's downtown. "This additional location will provide us with the capacity to expand beyond our current three markets, building Chattanooga Whiskey into a more nationally recognized premium bourbon producer from Tennessee," he said. 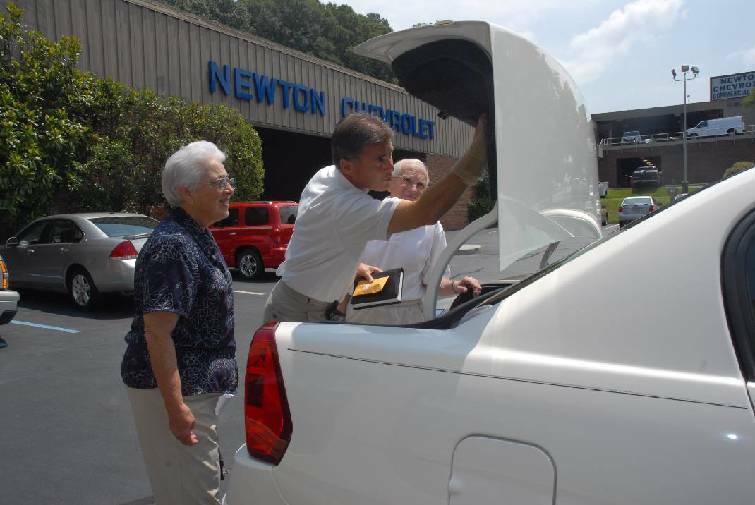 In this file photo, Newton Chevrolet sale representative Dwayne Pruitt, center, shows Nola and Frank Rogers the emergency truck release on a 2006 Chevrolet Malibu. The company plans to keep the micro-distillery it earlier opened on Market Street across from the Chattanooga Choo Choo. The site is on part of an 11-acre tract at M.L. King and Riverfront Parkway, which a Nashville developer and Lamp Post Properties, a subsidiary of venture incubator Lamp Post Group, agreed to buy from Chattanooga businessman Grant Law earlier this year. While Nashville's Evergreen Real Estate bought about 8 acres for new homes and other commercial uses, Lamp Post purchased the former Newton Chevrolet parcel that included the building which housed the show room. "The beginning of our distillery construction marks yet another milestone in our company's history," said Grant McCracken, head distiller for Chattanooga Whiskey. The current structure at the old dealership is about 46,000 square feet and has room to house over 4,000 aging barrels of bourbon whiskey at one time. Plans also include over 10,000 square feet of production space, over 2,000 square feet of office space where Chattanooga Whiskey will be headquartered, and over 4,000 square feet of future event space. A hearing before the City Council for the permit is set for next Tuesday at 6 p.m. According to the city, the property is located in a "convenience commercial zone" and a small-scale distillery is OK with that zoning, but a permit is required. Such a distillery is limited to producing alcoholic beverages in quantities not to exceed 1,000 barrels per month on site, with one barrel holding 55 gallons, a letter from the city said. Last year, Chattanooga Whiskey opened its micro-distillery, a tasting room and retail shop on Market in a 5,000-square-foot space. The location shows how whiskey is made and was the first legal distillery in Chattanooga in 100 years, according to the company. For over a year, the company has been developing its own style of Chattanooga Whiskey at the micro-distillery one barrel at a time. The company's journey began its owners decided to bring whiskey production back to Chattanooga. In 2013, the co-founders overturned state and local laws barring Chattanooga whiskey production. Chattanooga Whiskey Co. was formed and began labeling 1816 Whiskey. The bill, which passed the state Legislature, hangs on the tasting room wall. Stillhouse whiffed on a couple of prospective properties before deciding on the Market Street location. The M.L. King site is adjacent to Cameron Harbor, a $100 million residential and commercial development along the riverfront that could about double in value, according to officials. Evergreen, which already is developing part of Cameron Harbor, has proposed a variety of new housing and commercial space on the tract that straddles both sides of Riverfront Parkway. Aaron White, an Evergreen principal, said company officials also foresee a hotel at Riverfront and M.L. King, on the river side. A proposed site plan also includes a restaurant just off Riverfront Parkway. This story was last updated at 10:45 p.m. with additional information.